Keswick Codlin is a traditional English culinary apple, especially popular in Victorian times as one of the first cooking apples of the season. It is juicy and acidic and cooks down to a smooth puree. 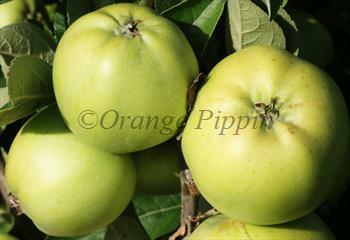 Victorian pomologist Robert Hogg praised it as "One of the earliest and most valuable of our culinary apples". It remains an excellent choice for the modern garden. The tree is almost foolproof to grow, producing heavy crops in almost any situation, and the apples have an excellent sharp flavour and become ripe early in the season when there is not much else around. Please fill in the details below and we will let you know when Keswick Codlin apple trees are back in stock. Ripens later than Keswick Codlin, but equally at home in difficult wet climates. Keswick Codlin is in flowering group 2. Keswick Codlin is partially self-fertile, but fruiting will be improved if there is a compatible tree of a different variety nearby. As the name suggests, Keswick Codlin is well adapted to the wetter climate of western England - although it will grow well in drier climates too. Keswick Codlin is a very reliable tree, producing heavy crops even in a poor summer. Like many heavy-cropping older varieties, it can sometimes lapse into biennial bearing - but this is easily avoided by thinning the fruitlets just after the blossom has finished, to prevent over-cropping. The first Keswick Codlin tree was found at the end of the 18th century, growing in a rubbish heap at Gleaston Castle near Ulverston at the southern tip of the English Lake District. It was subsequently popularised by a Keswick nurseryman.